Getting out of the house for the first time in a week with camera in hand and sun in the sky is always a treat. This day, having limited time, I decided to explore a tiny section of woodlands between our home and the railroad tracks. I knew Fernald brook crossed under the tracks a 1/4 mile from the underpass right down the road from the house, and found a way down the embankment and into the woods well short, where I could still get down the bank safely. Much to my surprise there was a well beaten path right inside the woods. Turns out some boys, some summer long past, had dragged lumber and poles out and built a major tree fort near the brook. There was even a bridge worthy of Teribithia. The stream itself, when I continued past the fort, was a maze of loops, cutting back and forth through lush forest, running pure and clean, but a deep tannin brown. 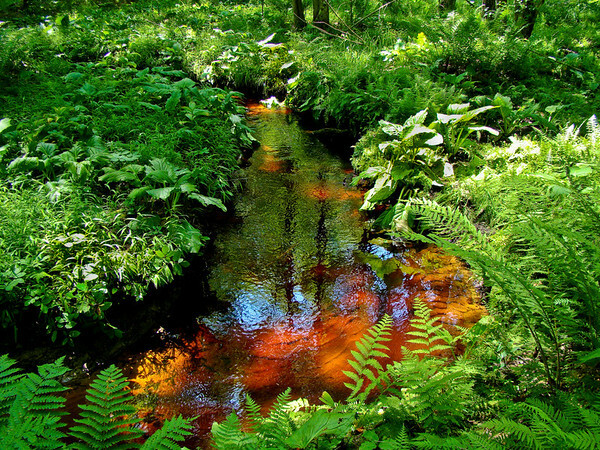 The sun slanting through the trees and reflecting off the sandy bottom of the stream caught all the color and created almost a stained glass effect. I took many shots, attempting to capture the effect. This is the stream as I first walked up on it, a simple framing of one straight section of loop across the stream’s wider bed among the ferns and skunkcabbage. Indeed a magical place. Sony DSC H50 at full wide. F2.7 @ 1/50th @ ISO 100. Programed auto. I was able to hand hold the shot at ISO 50 because of the Sony’s built in sensor image stabilization, and I was able to shoot straight Programed auto because I knew I could draw the green, sun on the ferns and leaves, highlights back in Lightroom with the Recovery tool when I got home. I did try a few shots with Program Shift, attempting a better overall exposure, but I could tell even on the camera’s lcd that I was loosing too much of the effect of the sun in the water. The result is a compromise, with some of the green highlights reaching saturation, but the stream bed standing out as it did while actually there. Recovery in Lightroom, then, for the highlights. A touch of Fill Light and the blackpoint to the right just slightly. Added Clarity and Vibrance, and Landscape sharpen preset. I was still not happy with the highlights so I went in with Lightrooms Local Adjustment Brush and painted adjustment masks, heavily feathered, over most distracting highlights. Reducing exposure in those areas, and adding some saturation to retain the color, made, I think, for a more pleasing rendering (and one closer to the actual visual impact of the scene). From Around Home, Kennebunk ME. very beautiful it does look like stained glass.